If the world has begun with a single quantum, the notions of space and would altogether fail to have any meaning at the beginning; they would only begin to have a sensible meaning when the original quantum had been divided into a sufficient number of quanta. If this suggestion is correct, the beginning of the world happened a little before the beginning of space and time. I think that such a beginning of the world is far enough from the present order of Nature to be not at all repugnant. It may be difficult to follow up the idea in detail as we are not yet able to count the quantum packets in every case. 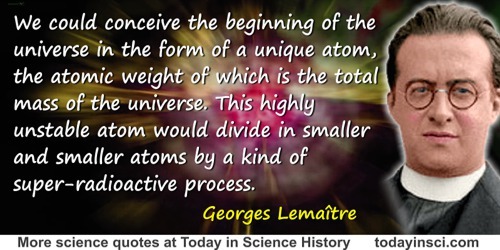 For example, it may be that an atomic nucleus must be counted as a unique quantum, the atomic number acting as a kind of quantum number. If the future development of quantum theory happens to turn in that direction, we could conceive the beginning of the universe in the form of a unique atom, the atomic weight of which is the total mass of the universe. This highly unstable atom would divide in smaller and smaller atoms by a kind of super-radioactive process. In a seminal short letter (457 words), 'The Beginning of the World from the Point of View of Quantum Theory', Nature (9 May 1931), 127, 706.